14 hours, 5 minutes left! "Sign up now to have all the latest deals & discounts delivered straight to your inbox." Founded back in 2008, SunTransfers has swiftly become one of the most reliable, low-cost airport transfer companies, operating from more than 400 airports worldwide. Whether you’re flying from Alicante, Barcelona, Cancun or Faro, you can search online for your destination and secure your beach, ski or city break transfers at the touch of a button. What’s more, you can find a huge array of low-cost price on our deals page so you can secure your taxi, minivan, minibus, coach or shared shuttle at the most affordable price. Booking online has never been easier, and with SunTransfers, it takes just 5 minutes! What’s more, if you need to make any changes or cancellations, you can do so for free up to 48 hours before your transfer is scheduled. No charges will be applied for debit or credit card payments either and there is always someone on hand to assist with the customer service team online 24 hours a day, 365 days a year. Browse with ease online right now and as well as great prices, enjoy fantastic customer service! With SunTransfers, you can take control of your booking from your very own online hub. Head to the My Booking page and from there you can login using your Booking Reference and Email Address. Make changes or amendments to your booking and find details for who to contact for any assistance. What if my driver doesn’t arrive on time? If you cannot locate your driver, you will need to contact SunTransfers immediately - within 5 minutes of your pick up time so they can assist you as soon as possible. With airport transfers, the driver takes into consideration that you might take longer due to customers and baggage. When you arrive at your meeting point if your driver is not there contact SunTransfers immediately. If you’re unhappy with the service you have received, you will need to contact SunTransfers where they will review your case. Complaints should be issued no later than 28 days after your return date. If you have any issues during travel, you should contact SunTransfers immediately in order for them to provide assistance. Priority numbers are displayed on your booking voucher. As one of Europe’s favourite private airport transfer companies, it’s no surprise that Suntransfers has millions of customer under their wing. Providing an unparalleled choice of services ranging from City transfers to low-cost holiday taxis operating from over 500 airports worldwide. 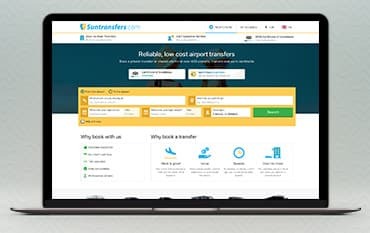 Explore hundreds of great deals and save money when you book online using one of our Suntransfers Voucher Codes which you can find right here on our deals page. We are constantly on the hunt for Voucher Codes for Suntransfers to help you with your money saving. Our experts check dozens of sites for secret codes including NHS discounts, student sites & social media channels saving you time & money!